Lock it up with style. 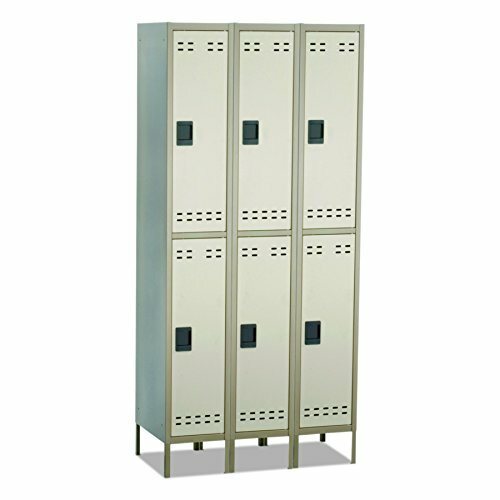 The contemporary two tone lockers will fit into any environment. Double compartment locker 12"W x 18"D x 78"H with strong, one piece uni-body design boasts a heavy gauge all steel construction so it can stand up to tough conditions in any environment where extra, secure storage is needed. Two compartment locker in 3 columns, 6 total compartments. Recessed handle with padlock provision for maximum security (padlock not included) has no protruding parts and includes a 2 point locking mechanism for complete security. Each double compartment has a hat shelf with coat hooks as well as adjustable hooks for coat rods. Two-tone, powder coat finish for durability. Lockers come fully assembled. Complements design of Safco Products Steel Storage Cabinets Models 5530, 5531 and 5532 (sold separately).